Tritoon vs. Pontoon | What Kind of Boat Should You Buy? The tritoon vs. pontoon debate is a hot topic just anywhere where people enjoy their time on a lake, particularly around Hayward and Cumberland. 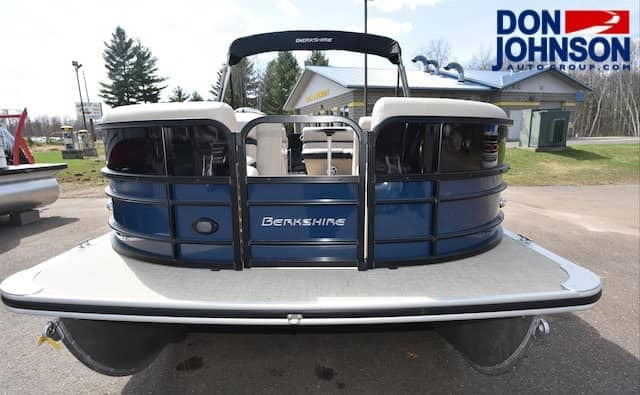 Fortunately, the differences between a tritoon boat and a Berkshire pontoon are pretty straightforward. The only real difference between a tritoon and a pontoon is the number of tubes that comprise the boat’s hull: a pontoon has two tubes, while a tritoon has three. While you can tell a pontoon from a tritoon at a glance, there are other differences that you should take into account. Because tritoons have three tubes that make up their hull, they also distribute weight more evenly on the water and can handle more horsepower as a result. This isn’t to say that pontoons are slouches in this regard, of course. There are also drawbacks to that increase in potential speed: while a tritoon can theoretically handle a bigger engine than a pontoon, a tritoon will also generally cost a lot more money. Both pontoons and tritoons are good for a relaxing day on Rice Lake and are also great for fishing. While a tritoon theoretically offers greater stability, you’re unlikely to notice the difference on small bodies of water. The third tube on a tritoon can make them much more difficult to steer, which can add complications when you’re navigating tight spaces or attempting to dock the boat. As a practical matter, a tritoon will require a larger trailer for transportation, and will require more space for winter storage.